The newest release of CAMWorks continues to demonstrate leadership in reducing CNC programming times as well as the automation of CNC programming tasks, and leads the way in CAM for Smart Manufacturing and Industrie 4.0 initiatives by embracing MBD and PMI. Scottsdale, AZ, USA, & Mumbai, India – November 14, 2016: Geometric Ltd. (BSE:532312, NSE:GEOMETRIC), today released CAMWorks 2017 with significant additions to the software focusing on customer needs and worldwide manufacturing initiatives, such as Smart Manufacturing and Industrie 4.0. The new capabilities in CAMWorks 2017 are a result of more than 60 customer-driven enhancements. "The additions to CAMWorks 2017 reinforce our vision of providing customers with a level of CNC programming automation well beyond the industry norm. 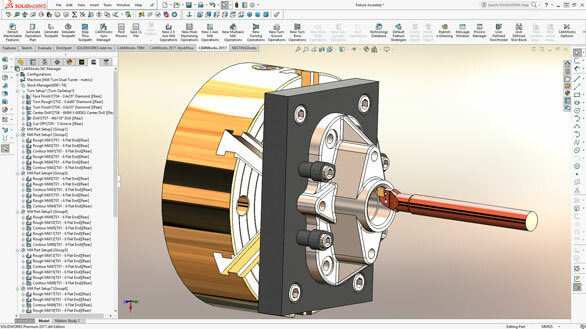 As the design and manufacturing world continues to adopt SOLIDWORKS® Model Based Definition (MBD), Product Manufacturing Information (PMI), and worldwide initiatives like Smart Manufacturing and industry 4.0, CAMWorks will lead in providing faster Design-to-Manufacturing solutions,” said Jim Foster, CAMWorks Vice President Channel Sales and Marketing. CAMWorks High Speed Machining, VoluMill™ Technology Expert - Provides recommended feed and speed parameters to maximize the performance of VoluMill high-speed machining.